Slice spaghetti squash in half, and scoop out seeds. Season liberally with olive oil, salt, and pepper. Place on baking sheet, flesh side up. Remove from oven, using a fork scrap the squash until it forms spaghetti like strings. Heat a large saute pan to medium high heat, add pork chorizo and cook for 5-7 minutes or until cooked through, breaking up the meat along that way. Pat down the spaghetti squash and fill each boat with the chorizo mixture. Top with fresh mozzarella cheese. 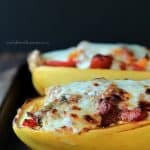 Place assemble spaghetti squash boats under a HIGH broiler for 8 minutes, until cheese is slightly browned.